See the Appreciative Way Library for electronic literature and resources. Watkins, J., Mohr, B. (2001) Change at the Speed of Imagination. Jossey Bass. Recently Released, this book is written by two of the leading trainers in the AI field and is intended to provide theory and practice for using AI in all organizational consultation such as strategic planning, team building, diversity awareness etc. Comprehensive, practical and easy to read. This is my first pick. Whitney, D., & Trosten-Bloom, A. (2002) The Power of Appreciative Inquiry. Berrett-Koehler, San Francisco. Two leading pioneers in the field of Appreciative Inquiry provide practical understanding of appreciative inquiry based on their use of AI in many business situations. Ludema, J. D., Whitney, D., Mohr, B., & Griffin, T. J. (2003) The Appreciative Inquiry Summit: A practitioners Guide for Leading Large Group Change. Berrett-Koehler. An excellent guide for designing and facilitating large scale, whole system appreciative inquiry processes. If you can't imagine doing AI with hundreds or thousands of participants then this is a good place to start re-imagining. Schiller, M., Holland, B. M., & Riley, D. Editors (2001) Appreciative Leaders: In the Eye of the Beholder. The Taos Institute. A collection of interviews with 15 leaders who live and lead from an appreciative perspective. An excellent text for those who like to see leaders in action rather than just study theory. Elliot, C. (1999) Locating the Energy for change: An Introduction to Appreciative Inquiry. IISD Winnipeg, Canada. An excellent text by Charles Elliot that explains both the theory and practical applications of Appreciative Inquiry. It is very readable and portrays both the theory and practice of appreciative inquiry. Many illustrations drawn from using AI in the health care industry. O.D. consultants, Bob New and Kathleen Rich-New, apply AI to personal and family life. In a series of engaging anecdotes and memorable quotes, they demonstrate how the principles and assumptions of Appreciative Inquiry can change your life. Hammond, S. (1998) The Thin Book of Appreciative Inquiry. Thin Book Publishing Co. Plano, Texas. 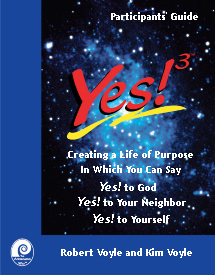 A basic book, it is very good, as an introduction to appreciative inquiry. It is also very thin. I think this is an excellent "starter" to give to a client to explain the appreciative process. Cooperrider, D., & Whitney, D. (1999) Appreciative Inquiry Berrett-Koehler Communications, Inc. San Francisco, CA. A short basic primer on appreciative inquiry, similar in size to the Thin Book. 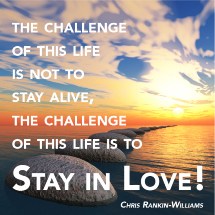 It is part of a collection of booklets entitled "Collaborating for Change." Another excellent starter to introduce appreciative inquiry to a client, especially for those who desire a more "how to" approach. Explains the 4D process. Hammond, S., Royal, C. (1998) Lessons from the Field: Applying Appreciative Inquiry. Practical Press. Provides practical demonstrations of appreciative inquiry as it has been used by Sue Hammond and Cathy Royal in a variety of settings. It demonstrates the creative ways that appreciative inquiry can be used in community settings. Also contains a helpful theological reflection on the 4Ds by Fr. Gregg Banaga. Srivasta, S. & Cooperrider, D. (Ed.) (2000) Appreciative Management and Leadership. The Power of Positive Thought and Action in Organizations. Williams Custom Publishing. Originally published in 1990 by Jossey-Bass. Considered by many as the basic text on appreciative inquiry. It is a collection of articles, edited by Srivasta and Cooperrider, from many of the pioneers in the field. It has been out of print for some time but has recently been released with two additional articles. An excellent introduction to solution focussed therapy with individuals and families. Although this is not from the Appreciative Inquiry school the similarities and parallels in AI and solution focussed therapy are striking. Senge, P. M. (1994) The Fifth Discipline: The Art and Practice of the Learning Organization. Doubleday. New York. Senge, P. M., Kleiner, A., Roberts, C., Ross, R. B., & Smith, B. J. (1994) The Fifth Discipline Fieldbook: Strategies and Tools for Building a Learning Organization. Doubleday. New York. While not exactly appreciative inquiry these two books by Senge and his associates describe the essential ingredients of an organization in which participative learning and being open to future possibilities are the norm. The fieldbook is especially helpful for those who prefer practical illustrations to imagine what is possible. Ahola, T. & Furman, B. (1997) Reteaming. The International Reteaming Institute. Snellman Printing House, Helsinki. A practical workbook for team building that uses a process that is not explicitly appreciative inquiry in the formal sense but has many parallels to the appreciative philosophy. Its origins are in Solution-Oriented brief therapy. It contains step by step work pages with numerous well drawn cartoon graphics, which makes it all appear deceptively simple. 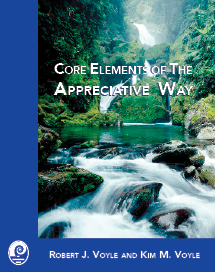 Personally I found the material helpful as I was learning about appreciative processes but I have not used it in an actual work setting and would be hesitant using it with "hard-core executives" as the graphics, while well done, make the material appear like an elementary school reader. Bergquist, W., Merrit, K., & Phillips, S. (1999) Executive Coaching, An Appreciative Approach. Pacific Soundings Press. Sacramento CA. 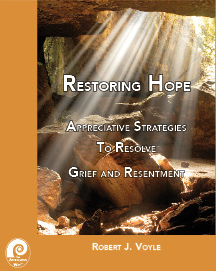 Primarily an introduction to Coaching with minimal focus on the appreciative inquiry process. It is probably too basic for many in the helping professions as it focuses extensively on interpersonal skills, that should have been covered in graduate school.